One can only imagine what must have been going through the minds of Daniel Boone and Joseph Martin that fateful Spring of 1775, as Boone and his road cutters passed by Martin’s little band completing their small station in Powell’s Valley. The two backwoods leaders had first made one another’s acquaintance in May of 1769 upon this very same ground. That was an auspicious year in the lives of both frontiersmen. Now, almost seven years later, their lives were about to be changed again, forever. Both Boone and Martin were now in the employ of Richard Henderson’s Transylvania Land Company, which was trying to commence the settlement of Kentucky in earnest. It was a do or die time, and everyone knew it. All through that year, Boone’s path, between Martins fort and the newly established Boonesboro upon the Kentucky River, was heavily traveled by those seeking a new life in the fabled new Eden beyond Cumberland Gap.John Filson, Boone’s first biographer quoted him as saying “I returned home to my family with a determination to bring them as soon as possible to live in Kentucke, which I esteemed a second paradise, at the risk of my life and fortune”. Yet as the race to settle the “middle ground” was on—What of the Nation? 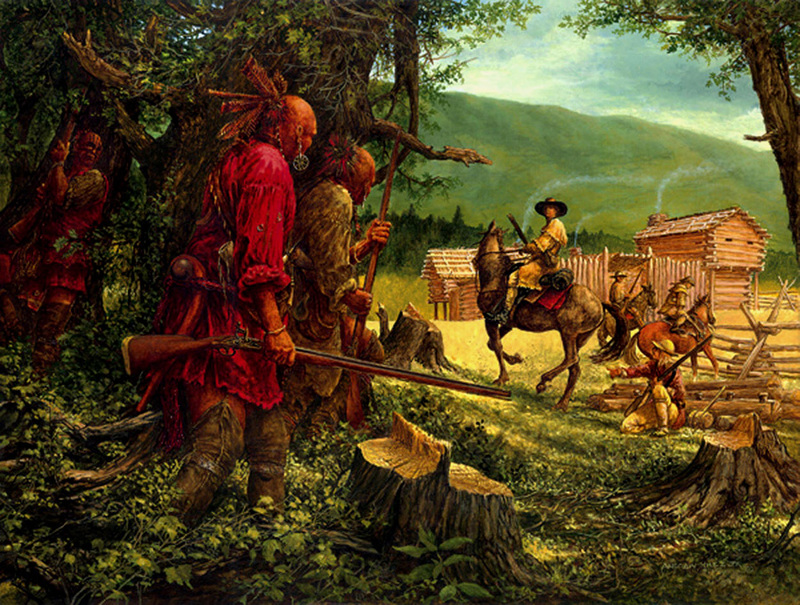 Would the Cherokee abide by the Purchase Treaty with Henderson? Would Dragging Canoe make good on his threat? Would the Natives remain neutral in the coming conflict with the mother country? What of the Shawnee? Would they ally themselves with the British? If so, it would mean a hot time indeed for these little far-flung wilderness stations. Even Richard Henderson became worried. In a letter to Martin dated July 20, 1775, which may have been delivered by Boone, Henderson asks Martin to “Keep your men in heart (control) if possible. Now is our time, the Indians must not drive us.”Martin, Boone and the other veterans of former conflicts with the natives, must have seen storm clouds upon the horizon. Of this season of impending danger John Filson has Boone saying; “The Indians had spies out viewing our increase in numbers and fortifications.They evidently saw the approaching hour when the Long Knife would disposes them of their desirable habitations and anxiously concerned for futurity, determined to extirpate the whites out of Kentucke. We were not intimidated by their movements, but frequently gave them proofs of our Courage.” The Battle for Kentucky was about to begin.